Bolivia's glaciers, situated between lat 14°37' and 18°23' S. on the southern edge of the tropical zone of the Southern Hemisphere, are affected by the change between intertropical circulation in the summer and southeast trade winds in the winter. During the southern summer, this generally means precipitation that decreases in amount and duration from north to south. This author believes that the term "summer" is appropriate for the rainy season in Bolivia, in contrast to the central tropics of Venezuela, Colombia, and Ecuador, even though Schubert (1992) gives a different view. Inhabitants of these countries, however, seldom refer to summer or winter; they speak of dry and rainy seasons. The dual climatic situation and the orientation and elevation of its mountain ranges are the determining factors in the occurrence and distribution of Bolivia's glaciers (fig. 1). In contrast to extratropical glaciers, the fundamental difference in glacier formation lies in the fact that the tropical snow reserves must be established during the summer. They cannot be established during the coldest period of the year because during the winter, as a rule, little to no precipitation falls. Ablation, on the other hand, takes place during the interseasonal periods and the winter when solar radiation is intense, as well as during summertime dry periods. This results in a completely different kind of mass-balance situation over the budget year, which is further complicated by irregularities in the annual precipitation cycle (Jordan, 1979). During the summer, the maintenance of a glacier is a delicate balance between the accumulation of snow reserves and the ablation from radiation at an increased temperature. Data from mass-balance measurements give more exact information (Jordan, 1992; Francou and others, 1995). 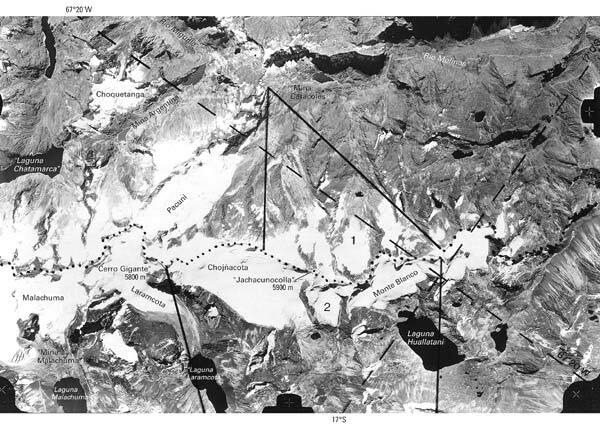 Ribstein and others (1995) discuss the results of a 2-year study of the hydrology of a 3-km2 basin in the Cordillera Real that is 77 percent glacierized. In this area, accumulation and melt periods coincide during the rainy season, but the amount of melt often exceeds precipitation, which is resulting in the rapid recession of the glacier termini. Because of the year-round high position of the Sun in the tropics, north-south exposure differences are less apparent than they are outside the tropics. In the Southern Hemisphere, the effect of the Sun increases in importance toward the south, however, and the cycle of cloud formation during the day must then be taken into consideration with respect to the exposure differences that affect the mass balance of a glacier. Because cloud cover descends very regularly at night to a level of 3,500 to 4,000 m, the glaciers are fully exposed to the morning Sun even during the rainy season. The cloudiness that develops during the forenoon protects the glaciers from radiation during the rest of the day (see fig. 10). Because the Sun shines on the eastern slopes in the early morning and because the northern slopes have greater solar radiation in the Southern Hemisphere, the east-to-north slope exposures have comparably smaller glacierization. The snowline is lower on the western and southern slopes and rises substantially (100 to 300 m) on the eastern and northern slopes (see figs. 11-13; Jordan, 1985). The solar-radiation effect increases toward the arid regions to the south. 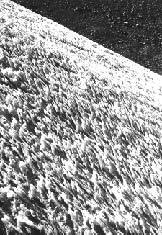 Combined with the extreme dryness of the air, solar radiation produces a peculiar phenomenon on firn and glacier surfaces, the intensified development of snow and ice penitents (Troll, 1942). The penitents phenomenon is also very dependent on the slope and radiation exposure and the annual climate cycle; these factors produce large differences, both with respect to time and space, in shaping the penitents (fig. 14). As a result of this differential surface ablation, which is typically a subtropical-tropical phenomenon, glaciers and snow patches become especially difficult to traverse toward the end of the dry season. Figure 11.--Annotated vertical aerial photograph of the southern part of Cordillera Tres Cruces. The watershed divide is shown by a dotted line. The two sections marked 1 and 2 show the locations of two ground photographs (figs. 12 and 13). The solid black lines indicate limits of coverage of each photograph. The aerial photograph and two ground photographs clearly illustrate the different degree of glacierization on the northeast escarpment (fig. 12) in contrast to that on the southwest escarpment (fig. 13) of the mountain range. Aerial photograph from Instituto Geográfico Militar, La Paz, taken 29 July 1975 [scale about 1:60,000]. Figure 12.--Northeast-facing escarpment of the southern Cordillera Tres Cruces (also called Quimsa Cruz). The terrestrial photograph shows the high lower limit of the glacier in the region of the Caracoles mine toward the end of the rainy season. The large white spots in the lower sector of the cirque walls are remnants of snow. In the foreground, Holocene Epoch moraines are visible. The location of the photograph is shown in figure 11 as number 1 between the solid black lines. Photographed by Ekkehard Jordan on 8 April 1977 from above Caracoles at an elevation of 4,800 m; lat 16°56'30"S., long 67°19'30"W.
Figure 13.--Southwest-facing escarpment of the southern Cordillera Tres Cruces showing the strong extent of glacierization of the western slope in the sector between Laguna Laramcota and Laguna Huallatani. The location of the ground telephotograph is shown in figure 11 as number 2 between the solid black lines. Photographed by Ekkehard Jordan on 12 May 1977 from the northern foot of Cerro Punaya; view to the east (elevation, 4,155 m; lat 17°21'50"S., long 67°24'30"W.). Figure 14.--Ice penitents on the Glaciar Laramcota, western slope of the Cordillera Tres Cruces. During the dry season, 50- to 80-cm-high ice penitents develop in several sectors of the tongue of the Glaciar Laramcota at an elevation of 4,900 m. Photographed by Ekkehard Jordan on 23 August 1980; lat 16°57'15"S., long 67°22'30"W.
A further manifestation of the distinctive daytime climate of high mountains on the southern edge of the tropics is the presence of glaciers with a high accumulation of debris. 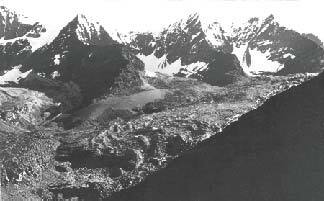 In addition, rock glaciers are found at elevations of 4,800 m and above, south of the actual occurrence of glaciers (fig. 15). Their exact classification is the subject of scientific controversy (see section on Rock Glaciers in this volume), and their exact areal distribution is not elaborated in this section because the author is inclined to characterize them, on the basis of their typical slope, as a periglacial permafrost phenomenon. Also, because of their modest size, they are not discernible on satellite images. Figure 15.--Cerro Tapaquilcha (5,827 m) in the southern Cordillera Occidental. In the upper slope region of the Tapaquilcha volcano complex, it is possible to see solifluction lobes and a light snow cover at the end of the rainy season, but glaciers are not present. The location of the annotated ground photograph is shown in figure 19. 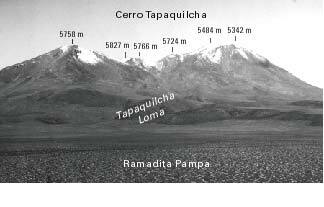 Photographed by Ekkehard Jordan on 10 April 1980 from Ramadita Pampa south of the Cerro Tapaquilcha looking north (elevation, 4,550 m; lat 21°40'03"S., long 67°57'W. ).